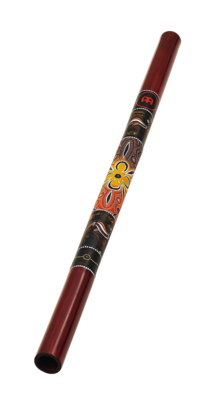 These Didgeridoos are a great way to get started on the oldest wind instrument in the world. It makes a distinctive drone with harmonic overtones, and goes great with all kinds of percussion. Our didgeridoos are made from Bamboo. I tried to make a didgeridoo twice but not ever having touched one had no idea how to shape the mouthpiece etc so not a success. I decided to do a local google search. This one was less than an hour away so we made it a day trip. I am impressed, it is very nicely finished. I was also able to make the real basic digeridoo sound pretty much right away (not a trumpet sound) though still a long way to go - obviously. When you hit the note properly the resonance and vibration is a bit of a shock, like the whole thing almost shakes. It is quite a satisfying sound and feel I think this is a real playable instrument! Also a shout out to the staff at Long and McQuade in Fredericton, they made me feel like my $39 sale was just as important as the big $$ that were going out the door ahead and behind me. Made my day. I've had it for a while and it has been great! I would highly recommend this didge to anyone wanting to get into it. It has a good quality sound, feel, and appealing design. Its great in performances, and quite durable. Also mouthpiece is tapered for fairly comfortable playing so no wax needed. Overall defiantly a good buy.